Campaign signs surround Congress Square on Tuesday as Portland residents take to the polls to decide the fate of the public space. 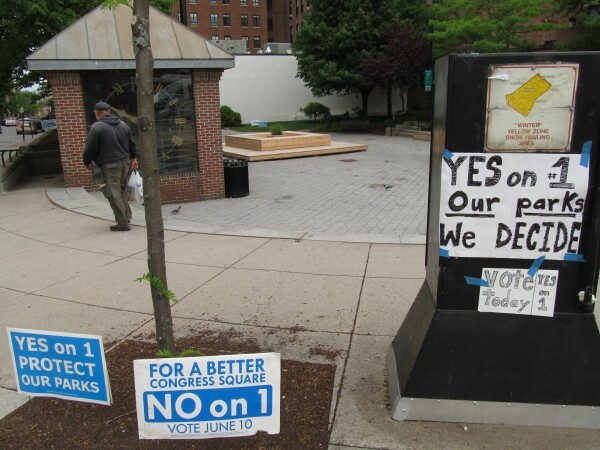 PORTLAND, Maine — After months of public debate and a court battle that went to the highest levels of Maine’s legal system, Portland voters chose by a narrow margin to support an overhaul of the city’s land bank commission ordinance that will trigger a new vote on the sale of Congress Square Park. While the high-profile Question 1 on the Portland ballot has implications for public spaces far beyond the 14,500-square-foot Congress Square, the referendum was widely seen as a showdown over the proposed sale of the publicly owned square to private hotel developers. With all of the city’s 11 polling stations reporting, supporters of the referendum held the lead, with a 4,888 to 4,605 advantage, or 51 percent of the votes. Betsy Krementz — an elections clerk working at Reiche Community School, one of 11 polling stations across the city — said late Tuesday afternoon turnout had been heavy at the polls. The referendum — put on the ballot through a fall petition campaign spearheaded by the groups Protect Portland Parks and Friends of Congress Square — asks Portlanders whether to approve a slate of reforms to the city’s land bank commission ordinance. Under the proposed changes, Congress Square and 34 other public properties would be given additional protections against being sold. The newly revised ordinance would require at least eight of the nine city councilors to approve a sale of any of the protected properties, and it would trigger another citywide vote to ratify any such sale decision passed by seven or fewer councilors. James Cohen, chairman of the No on 1 campaign, said he expected the votes to be lopsided against the referendum if the issue wasn’t muddied by the inclusion of other parks. “Obviously, the city is divided on the issue,” Cohen told the Bangor Daily News on Tuesday. “The referendum is confusing. It purports to be about protecting the parks of Portland, but really, it’s about one thing. Do we want to move forward with Congress Square and bring millions of dollars and jobs, or do we want to vote yes and prevent that project from moving forward? “If Congress Square alone was on the ballot, I think there’s little doubt Portlanders would vote overwhelmingly to fix the park [by allowing the sale],” he continued. Because the opposition groups requested the petition paperwork before the City Council’s 6-3 September vote to sell the disputed space, the ordinance change would be retroactive and, if passed at the polls Tuesday, immediately would force a second citywide vote whether to uphold the Congress Square sale. The council voted in September to sell nearly 9,500 square feet of the plaza for nearly $524,000 to Ohio-based private developers RockBridge Capital LLC. RockBridge helped finance the nearly $50 million renovation of the historic former Eastland Park Hotel nearby and hopes to use the additional Congress Square space for an event center. The little public polling that has been done on the issue indicated that, at least in September, the sale was unpopular. 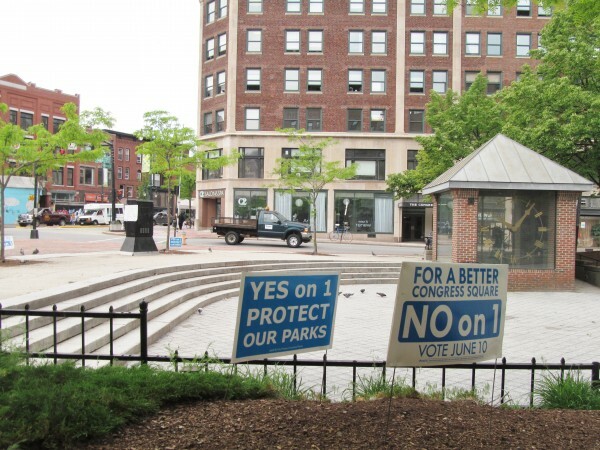 Facing the June referendum, the City Council also has, in recent months, passed a slate of alternative ordinance changes that would protect many of Portland’s public spaces — including Deering Oaks Park and the Eastern Promenade — against sales but allow the Congress Square deal to advance. Supporters of the sale, including the Portland Community Chamber, have said the project would revitalize a long underused part of the city’s downtown. But opponents, including the Friends group, said the deal sets a bad precedent of selling public space to private entities, and the park was only underused because the city let it fall into disrepair. Petitioners were finally assured that their ordinance proposal would appear on the ballot last month, when the Maine Supreme Judicial Court ended a months-long legal battle over whether the petition effort was valid. City attorneys urged the court to throw out the referendum because, they argued, it illegally bypassed the administrative authority of the Land Banks Commission by placing 35 specific properties under the ordinance. The state’s highest court rejected that argument, among others, ruling the ordinance change represented a legal legislative action akin to the recent alternative ordinance changes approved by the City Council — which is the city’s legislative body, not an administrative one.